Lisa's Comedy Rap group THICK7 just dropped their latest album "Marijuanaholic". T hursday night at the El Portal Theatre in North Hollywood, a packed crowd got its comedy ripped from the headlines. A showcase sponsored by CBS to spotlight diversity and expose almost two-dozen diverse performers was just getting underway when the show's director, Rick Najera, as he welcomed the crowd, was interrupted by a crew member telling him that the cast had mysteriously disappeared. "Are they boycotting the Oscars?" Najera deadpanned. Within moments, the stage was swarmed by almost two dozen performers singing, dancing and celebrating people of color. As the uproar raged over the absence of people of color in this year's Oscar acting categories, diversity was a laughing matter at the annual sketch comedy that CBS sponsors to help find actors from nonwhite, unconventional or disadvantaged backgrounds (the brief run ended Friday). The showcase at the El Portal is timed for January because that's when the broadcast networks begin the process of casting shows for their pilot lineups. Organizers this year auditioned 2,500 performers who were then winnowed to a cast of 23 for the performance. Then the doors are thrown open for managers, agents and creative executives from major networks and studios to sample the wares. The humor is raw and definitely not for the easily offended and is flavored by an abundance of sexual humor and pokes at stereotypes. In one sketch — a black version of "Seinfeld" — Kramer, played by the protean Lucas Hazlett, isn't just twitchy, he suffers from a serious cocaine problem, complete with a white powder ring around his nose and mouth. And the sketch concluded with a topical zinger aimed at the police: "Shoot a black guy, get promoted; shoot a white guy, get fired." The audience of movers and shakers seemed to eat it up, laughing and applauding the low-frills hourlong production, which moved at a rapid-fire pace. On a stage with no real set, the performers raced through numerous costume changes with charged comic electricity. 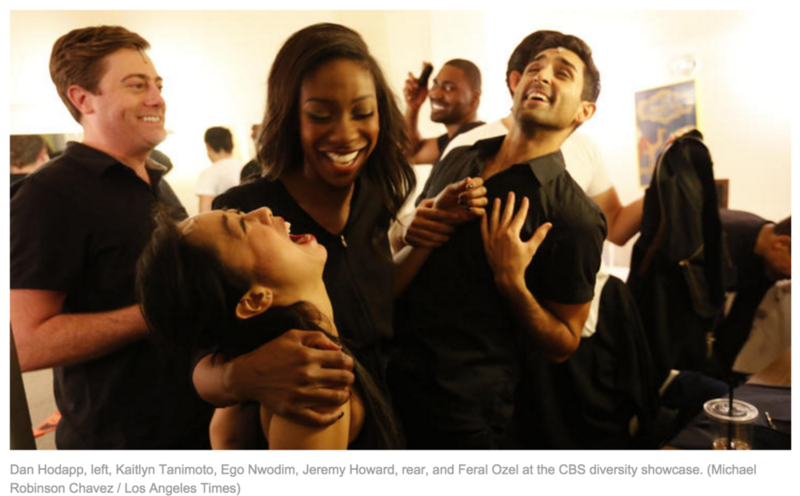 "We probably have four- or five-hundred casting directors come, and the rest are agents and managers, development executives," said Fern Orenstein, a senior vice president of casting at CBS who serves as producer for the showcase. "Everyone comes." The showcase's timing this year fell smack in the middle of the furor over the lack of diversity in the Oscar nominees, giving it an added relevance as the movie industry became embroiled in a nationwide controversy. #OscarsSoWhite became a familiar hashtag. Several celebrities, including Spike Lee and Will Smith, have said they will not attend the ceremony in protest, and pressure mounted on host Chris Rock to back out of the job. Cheryl Boone Isaacs, president of the Academy of Motion Picture Arts and Sciences, last week promised to double academy membership of women and minorities by 2020. Interviewed minutes before the curtain went up, Najera, a noted Latino playwright and performer, said the showcase has been successful because it takes a comprehensive approach. "It's a diverse team behind the show as well as the people in front," he said. "That's the difference." Indeed, the organizers spend a lot of time working with minority writers as well, developing hundreds of sketches to find the two dozen or so that make the final cut. Thursday's show was a mix of the topical and the evergreen. But the sketches that drew the biggest laughs often had the newsy punch lines. The opera "Carmen" was redone with the heroine harassed by men in hard hats and work vests who sang a refrain asking why she didn't smile at their offensive remarks. And Peter Pan was caught off guard when one of his child followers expresses an earnest desire for "a wall to keep out Mexicans" and squashes Tinker Bell because she might be an immigrant. "Trump 2016," the children chirped in unison. Television programming has not faced such a polarizing national moment à la #OscarsSoWhite — yet. But activists have complained for years about poor representation of nonwhites in TV programs, and experts have said that despite years of work, minorities remain underrepresented in virtually all facets of the industry. Some believe that outreach efforts like the diversity showcase are one of the best tools the industry has to address the issue. CBS is not the only network to use showcases as a diversity tool; NBC and ABC have discovered talent through similar means. Past shows have helped launch the careers of Justin Hires of CBS' upcoming "Rush Hour," Kate McKinnon of "Saturday Night Live" and Randall Park of ABC's "Fresh Off the Boat." Casting directors have gotten the message. After the show wrapped, the lobby of the El Portal was so crowded that attendees and cast members stood shoulder-to-shoulder in a packed-to-capacity reception, where additional networking was taking place, assuming anyone could actually be heard above the din. But this year's show has in fact already achieved impressive results. CBS' sitcom "Two Broke Girls" has cast about a half-dozen of the performers who were onstage last week, according to casting director Julie Ashton. "I constantly need to find funny, new, fresh people since we have already used hundreds if not thousands of actors for the show," Ashton said. "And because it's so important to Michael Patrick King, our show's creator, to represent the diversity that exists in Brooklyn, it is very organic to cast a lot of these people. "So for me to see all these wonderfully diverse, funny people in less than 90 minutes, Fern is doing me a huge favor by giving me comedy gold in what would have taken me hours and hours of pre-reads to find," Ashton added. "They want to find the best diverse cast they can to show Hollywood that diversity is needed, it's a good thing," cast member Maline, who trained with the Groundlings comedy troupe and has scoliosis, said backstage just before the curtain. "It's missing, and we need more of it." Londale Theus Jr., who played the black Seinfeld in the aforementioned sketch, agreed: "I'm glad I got to be part of this, because I feel like I'm part of the future that will change things." "There needs to be change," Maline said. "And to be in a show in a time like this is amazing." The filmmakers behind RITUAL talk about their film at ScreenCraft's event at the Los Angeles Film School. Panelists include producer Chelsea Peters, director Mickey Keating and actress Lisa Marie Summerscales. Courtesy Lionsgate Home Entertainment Available December 31, 2013 Starring Lisa Summerscales, Dean Cates and Derek Phillips, Ritual tells the tale of a young woman and her estranged husband,who become entangled with a horrifying cult and find themselves swept into a world of kidnapping, violence and satanic rituals.A long time ago, Tom and Lovely were married and everything was perfect.